The Doctor, Tegan and Turlough! Done!! Prints and posters are being readied for the Hurricane Who convention. I can't wait for people to see this one. 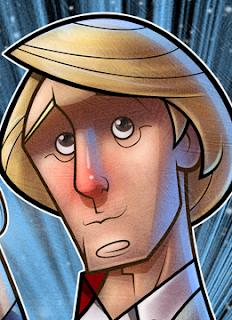 The Fifth Doctor is MY Doctor and I still watch his episodes with fondness. I can't wait to meet him. I have never met a Doctor before and I LOVE the fact that it would be Peter Davison!! Keeping my fingers crossed that everything goes smoothly at the printers as I am cutting it close to the show. Enjoy! Almost Ready for the Hurricane. 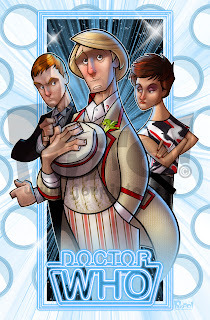 I think I may have finished my picture of the Fifth Doctor, Tegan and Turlough!! Yay!! Just letting it breath for a bit so I can look at it with fresh eyes in a day to see if there are any tweaks or such that I overlooked. Gonna give you a sneak peek tho! Been waking up early and going to bed late trying to get this one done. Can't complain too much since some of my time is spent having fun with my buddy and his family visiting from Seattle. By the time this posts I will be back in the coal mines wishing I was working on this instead. Running out of time for Hurricane! Work has been SO crazy that I have had very little time to work on my new picture for the Doctor Who show in early November. I am picking up steam now but I think it should have been done by now. So let me at least share my pencil drawing. As Peter Davison is scheduled to be there (and he is MY Doctor! 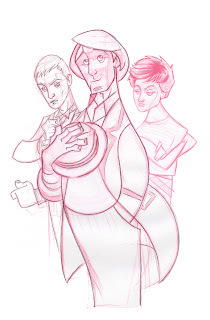 ), I figure a new pic of the 5th Doctor and two of his companions. I must admit, I did have a crush on Tegan!! Hurricane Who that is. Once again I will be at the show here in Orlando and this year promises to be bigger. From what I heard, I will not be the only artist there this year and I hope that is a good thing! I did want a large amount of new Doctor Who themed art and ones that were related to the guest list but I am falling short on time as this past year was full of unforeseen obstacles. I do have about four new Doctor Who pics already done (if you count Inspector Spacetime) and other assorted new pics but I am hoping to get at least one new pic that has a guest in it! Let's keep our fingers crossed!! 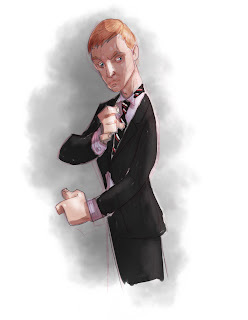 Here is one character from the new pic that I mocked up quick in Photoshop. Not done or refined in any manner but I like how it looks. Anyone recognize him??? Well, here we are. The end of yet another artistic journey. I know you were all waiting with abated breath and are simply speechless by the outcome. Ok. Not really. 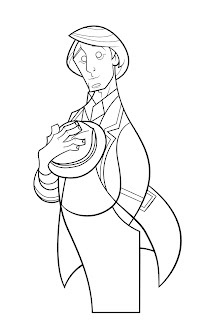 But we are moving forward with a new Doctor Who piece that I hope to get finished in time to have at this years Hurricane Who show. 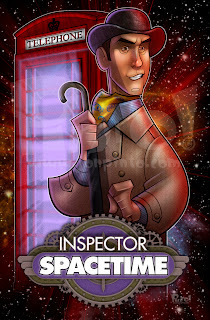 The good Inspector should be joining us there as well. Hope you all enjoy. Moving pretty quick on this pic. Has been raining in the early mornings when I normally go out for a brisk walk for some much needed exercise. Instead of going to bed when I notice the weather, I have been taking advantage of the quiet time to work. Has been very productive and I like how much I am getting done but I also really need to keep walking too. The muse has a truly seductive song. Here is the progression of the good Inspector. I don't. I know of the show and like the cast but for some reason or another, I don't have this on my viewing schedule. Apparently the writer(s) of the show are Doctor Who fans and have written in a thinly veiled homage/parody of my favorite time-lord. 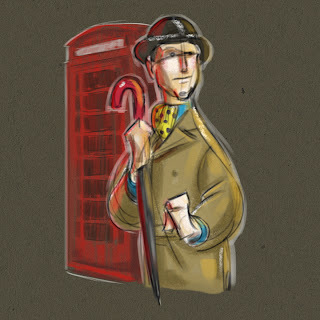 Inspector Spacetime!! I watched the clips of him on YouTube after learning of this and thought it funny. Then I noticed that LOTS of Whovians have taken notice as well. Why not? It's fun! I doodled this on my Asus tablet while watching TV. Nope. Wasn't Community. Got my original series cast of Star Trek done! I like it. I was getting nervous in doing all the one point perspective head shots that it was "boring". I muddled thru it and when I put them together as planned it worked out. I was trying to channel a bit of Rockwell. 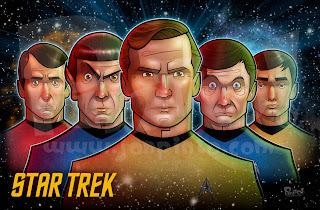 Don't know if THAT is really possible but I like how it turned out and knowing that if this one goes well I can do the same for each Trek show and then have workable pieces for a large, all-encompassing poster. Maybe. Well, "Live long and prosper!"